Amir H. Fallah returns to The Third Line with a new body of work titled Almost Home reflecting on the idea of belonging outside one’s country of origin. 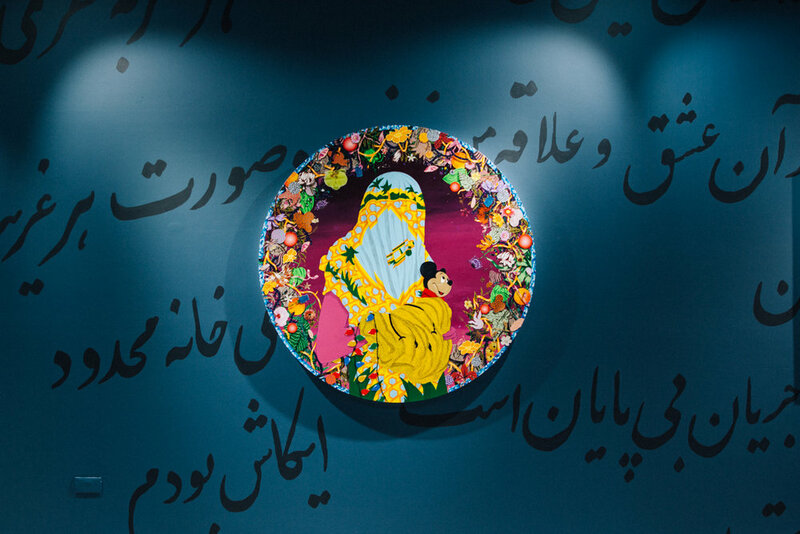 The exhibition shows a series of the artist’s signature style landscapes and portraits, respectively referencing floral Persian ornamentation and Iranian-American immigrants who have not returned to Iran sincetheir departure several decades ago. Amir works deeply from his own experience, and explores what it means to exist outside the homeland. Almost Home looks at narratives that seem congruent in the immigrants’ lives. The concept of a home takes on a new meaning: it is fluid, transient, constantly evolving; it is not one grounded in old land, seeped with the history of generations that have passed through it. A new home, then, is rebuilt holding on to constants that people of migration identify as markers of a culture that they need to perpetuate in newer landscapes. The impermanence of these new homes is a reflection of a very stark reality of modern day mobility and livelihood. The Filmmaker’s Reflection displays Amir’s bold style of portrait painting. The subject’s identity remains anonymous, though it is surrounded by an assortment of items, primarily personal belongings and memorabilia. These pieces of clothing, jewellery and mementos reference the home, the subject’s roots and cultural heritage. Along the edges of the painting is an elaborate tangle of flowers and vines similar to the ornate borders found on Persian rugs. Amidst the paintings one finds Farsi lyrics to the Simon & Garfunkel song Homeward Bound. The calligraphic text was converted using Google Translate, deconstructing the song throughout the process. By combining aspects of American culture with the historical tradition of Persian calligraphy, the text mirrors the subjects’ experience of getting lost in translation. In creating this surreal window into a highly schematic vision of typified memories, Amir plays what it means to be away from one’s home and country of origin, and creates an ironically tourist book condition of displacement. Adding a second layer of meaning to the exhibition, Amir chooses to exhibit the works in this home in Dubai, a city that has become a safe haven for thousands of Iranians. Many of Amir’s American-Iranian subjects cannot return to Iran, but by bringing their portraits to Dubai, Amir imagines it as one step closer to their homeland. And so, bringing them almost home. Latest Art & Design Articles.